The United Network for Organ Sharing (UNOS) is the largest non-profit organ donor and transportation organization in the United States. It is also the only organization to ever operate under the National Organ Transplant Act. The services UNOS provides are critical to organ donors and recipients. Every 10 seconds, someone is placed on the national organ waiting list and UNOS is the organization that connects those needing an organ transplant with potential matches in its system. Since its inception in 1984, UNOS has helped over 600,000 people across the United States receive an organ transplant and hopes to increase that number with more efficient training and organ donation education. UNOS not only matches organ donors with potential recipients, but also trains its staff on organ matching and effective practice sharing. They serve an additional external group of medical professionals who complete training to satisfy continuing education credit requirements. UNOS provides these individuals with training on general medical topics and those relating specifically to organ donation. 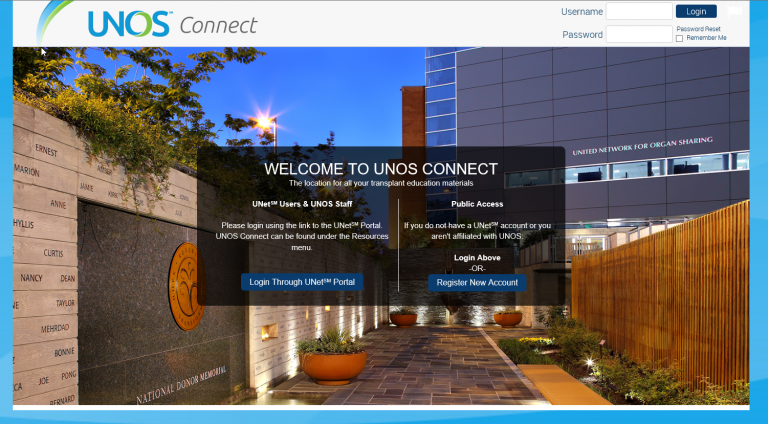 UNOS began searching for a learning management system (LMS) that could not only address the aforementioned frustrations but also their desire to cater to the medical professionals that operate on a time-sensitive, 24/7 schedule. To alleviate UNOS’s need to manage its training on a number of different storage and hosting sites, eLogic Learning implemented its eSSential LMS with extended enterprise functionality. This provided UNOS with one centralized location for all its training. Now, through the extended enterprise and organizational hierarchy function, the organization is able to create, track and assign users to whichever training site is most appropriate. This single LMS with dual-site functionality allows for a more tailored learning experience for each user group. Before implementing eSSential, UNOS used a number of third party applications (such as survey and web conferencing software) that were completely separate from the LMS, which created additional work for administrators to ensure sure all applications were kept up to date. With eSSential’s ability to integrate with a variety of external applications (such as WebEx conferencing software), UNOS now automatically pushes information back to these integrated applications. Similarly, eSSential also helps businesses eliminate the need for external applications because of its many built-in features. For example, UNOS was able to use the LMS’s built-in pre- and post-training survey capabilities as opposed to continuing with their Survey Monkey subscription. Because many medical professionals operate on a 24/7 schedule with little time to partake in training, UNOS created short, 15-minute videos with Continuing Education Points for Transplant Coordinators (CEPTCs) that could be tracked by administrators. Users now have 24/7 access to their certifications via their account in the LMS and no longer need to reach out to administrators in order to access their completion certificates. Additionally, users can now complete training on any device because of eSSential’s new responsive design. This means training will automatically resize to whichever device is being used and allows the on-the-go users to complete training whenever and wherever they like. In October 2015, UNOS delivered its first training course to employees via eSSential. The training aimed to improve awareness of UNOS’s security policies and saw a 99.18% completion rate with only 3 of 362 employees missing the training deadline. Through its pre- and post-training survey results, UNOS reported a 12% increase in employee’s ability to describe the organizations security policies and maintain a secure working environment. In using eSSential’s robust reporting features, UNOS was able to make connections between key events and spikes in training completions. The organization is looking forward to administering its external continuing education training now that Version 10 of eSSential has been pushed out to all clients. looking for a new lms?